Mia Hubbert sends along an image of the pocket patch issued without the loop. I’ll update the original post with the image. I had previously posted about the 2010 Section NE-4A Conclave which was held at Camp Mountain Run and hosted by Ah’Tic Lodge #139. I had previously posted about the pocket patch. Similar to the 2009 Conclave, there was also a participation patch for the event, which is shown below affixed to the patch. This was one of my acquisitions from the WNYTA 36th Scout Memorabilia Trade O Ree last month. Four years ago we were posting about the merger of Ty-Ohni Lodge #95 and Ganeodiyo Lodge #417. 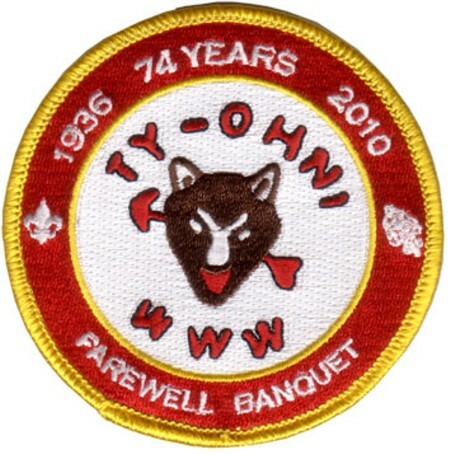 Here is one of the final event issues from Ty-Ohni Lodge which was issued for their Final Banquest. The design pays tribute to their C1, probably the toughest issue from the Lodge. 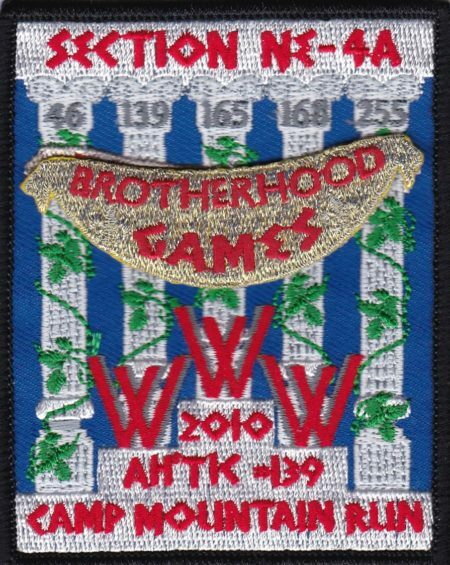 Section NE-3A 2010 Conclave Staff Patch? I had previously written about the 2010 Section NE-3A Conclave which was held at Camp Russell and hosted by Ga Hon Ga Lodge #34. 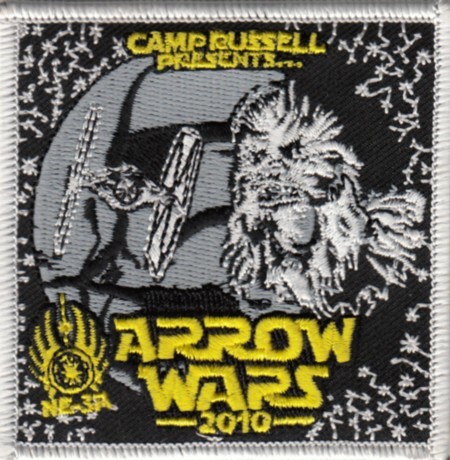 The theme was Arrow Wars 2010. I had asked if there were any other issues, and recently came across what I believe is the Staff patch for the event. 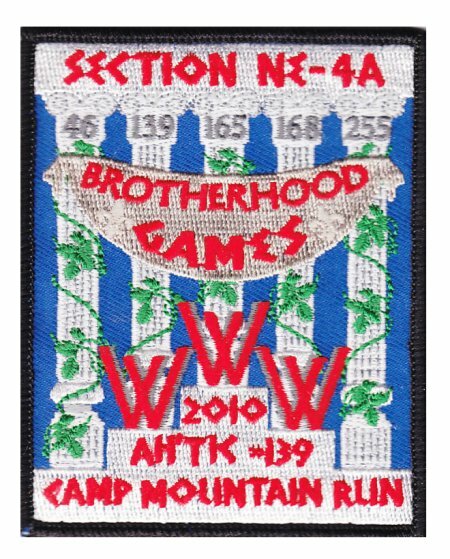 Section NE-3A 2010 Staff Patch? Were there any other issues? I’ve updated the original post with this picture. I ran into Don O’Brien at the Camp Woodlands TOR last month. He had his Otahnagon Lodge #172 display set up there and I noticed a number of previously unreported issues on it. First up is their dinner flap from 2010. Thanks to Bob Black for the scan. I need one for my collection if anyone has one available for trade or sale. 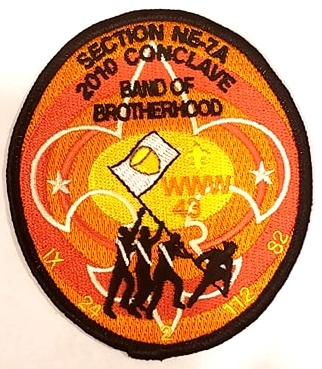 Nick sends along a copy of the Section NE-4A 2010 Conclave patch. The event was held at Camp Mountain Run and hosted by Ah’Tic Lodge #139. 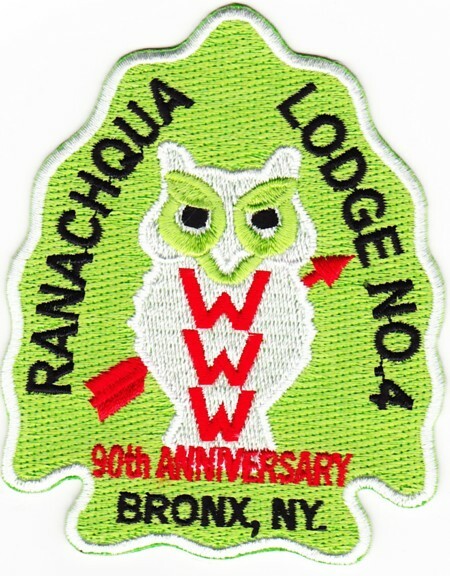 Here is another issue from Ranachqua Lodge #4 issued at their Winter Banquet to celebrate the 90th Anniversary of the Lodge in 2010. While it was issued for the banquet, Blue Book policy would call it the A5, since there is no indication of an event on the patch.